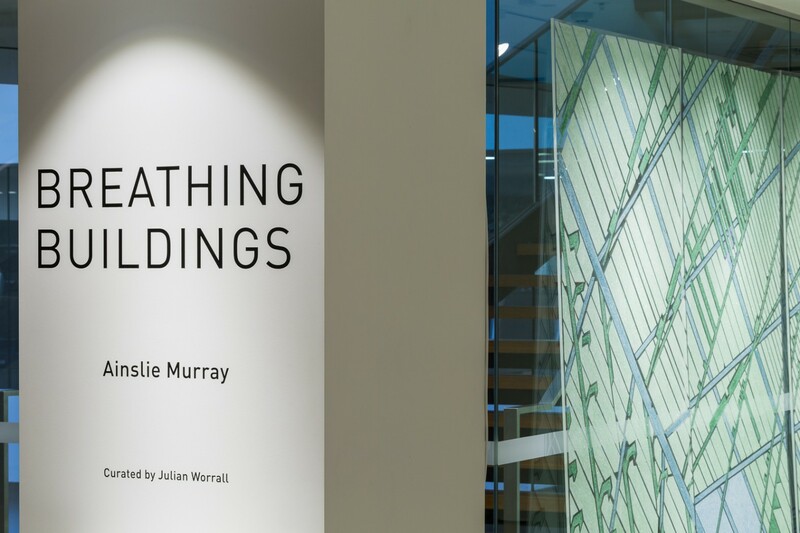 Breathing Buildings was an exhibition of works curated by Dr Julian Worrall in response to three buildings by acclaimed Japanese architect Kengo Kuma. A series of moving images and installations explored qualities of material dissolution based on real spatial experience, and conceptualised the buildings as a series of filters that act between body and environment. The exhibition was held at the Japan Foundation, Sydney. Everyday Life is a creative research project involving collaborative practice across the disciplines of architecture, performance and engineering. Airflows within and around a pair of performers are visualised as they enact a series of improvised ‘everyday’ movements. The movements and resulting interactions are developed from ordinary, routine, and habitual patterns of daily life, that through their regularity become ‘invisible’. The visualisation of these patterns coupled with the visualisation of the contextual airflows form an architectural proposition in which space is agitated, stirred and concocted by the body and where inhabitants actively generate ‘architecture’ through their movement. This work was a floor-based temporal installation that grew from a quiet obsession with the ceiling in the Australia Square foyer. The ceiling was understood as a repetitious pattern of solid and void. The installation questioned the stark solid-void duality and investigated the invisible or barely-perceived physical matter that occupies the void spaces. The voids were reconsidered as positive volumes that have the capacity to cast a ‘shadow’ upon the floor. Fine particulate matter, a tangible physical component of air and a standard indicator of air quality, was captured and arranged on the floor plane in an intricate geometric pattern that placed the floor in direct visual dialogue with the ceiling. 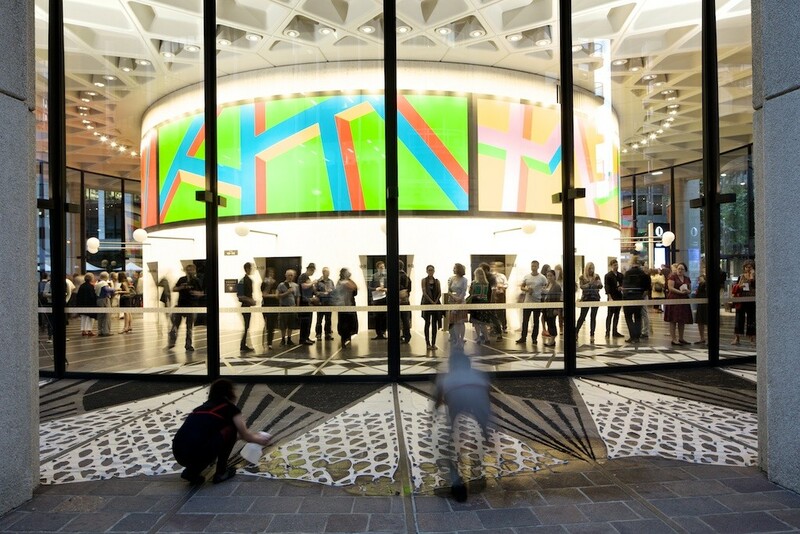 The installation was comprised of two parts separated by external glass wall – one part was inside the foyer, and the other part continued outside. Inside, the voids of the ceiling grid were referenced on the floor using areas of finely crushed glass arranged directly on the floor. The crushed glass is considered as particulate matter, a luminous representation of the invisible suspended matter of the air. Outside, the solids of the ceiling grid were hand cut out of water-soluble embroidery film to form a geometric ‘web’, which was interspersed with areas of black silica. 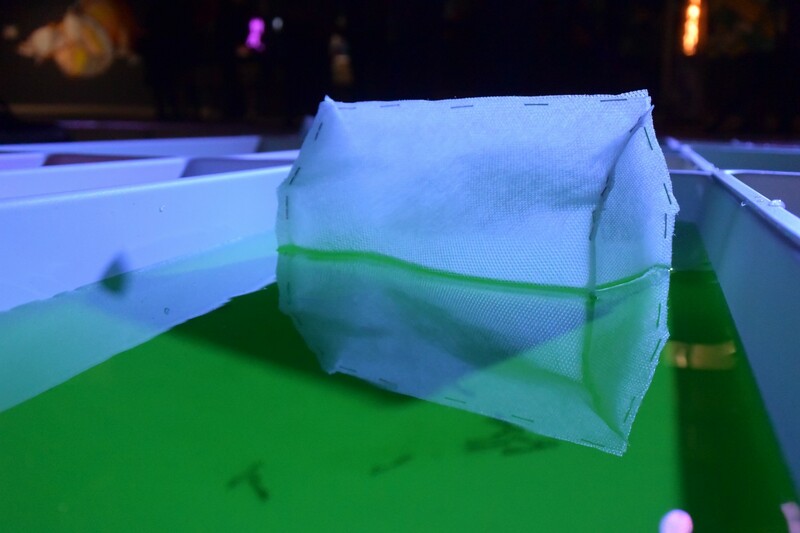 During the evening, performers and the audience sprayed a fine mist of water on the film, slowly dissolving the work until it disappeared completely. 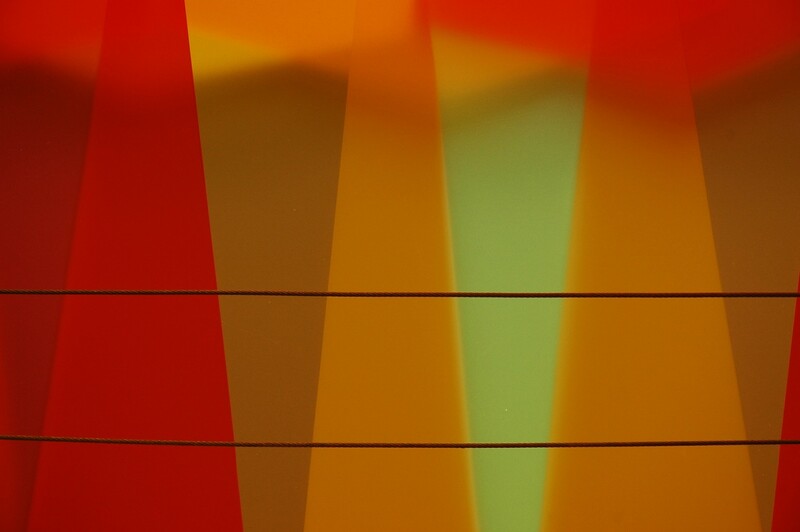 In this work, solid and void were inverted, reversed and imaginatively multiplied across the horizontal planes of the building. 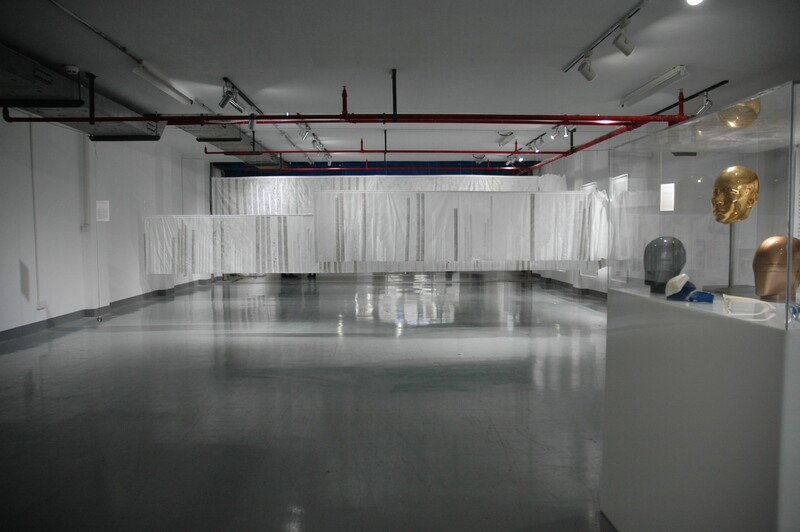 Particulate Matter is a site-specific installation investigating Shanghai’s atmosphere. Data reflecting the fine particulate matter in the air is ordered and coloured according to concentration, season, and wind conditions. On still days, the particulate matter renders the air visible and it hangs there—everywhere—as toxic matter to be wrestled, resisted, filtered. On windy days, the air is invisible again, but spaces are torn into the atmosphere by fast moving particulate matter. The structure of the atmosphere is interrupted, its composition compromised and patterns of violent intrusion dominate the skyline. 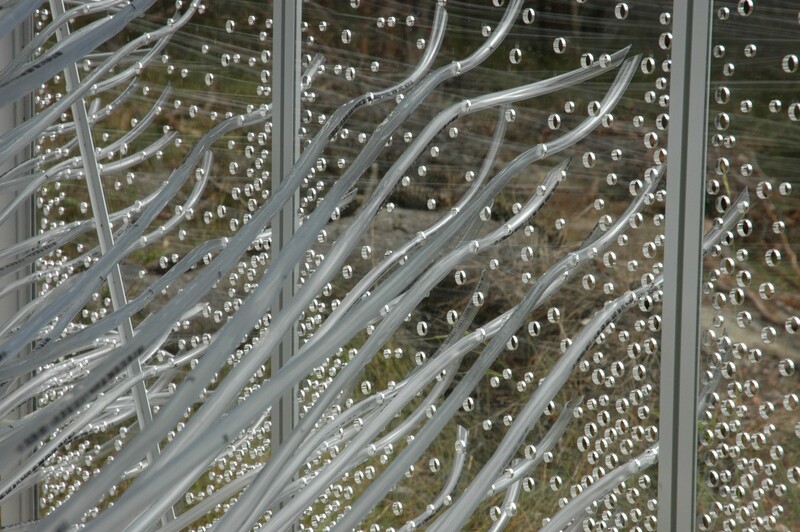 This work explores the intersection of art, architecture and landscape and is part of a sequence of bespoke spaces that respond to the specific conditions of a garden site. This iteration is made especially for small children. A jewel-like space of colour and delight is positioned within the garden to function as a hideout, cubby, and retreat. Visitors sit within the space and quietly absorb the kaleidoscopic effects of colour and pattern in relation to the surrounding landscape. House for a Lost Tree focuses on pattern-making and is influenced by the forms and structures of the natural world. The flexible leaf-like cladding rhythmically overlaps to mix colours and generate rich geometries to produce an immersive, atmospheric and contemplative space in the landscape. 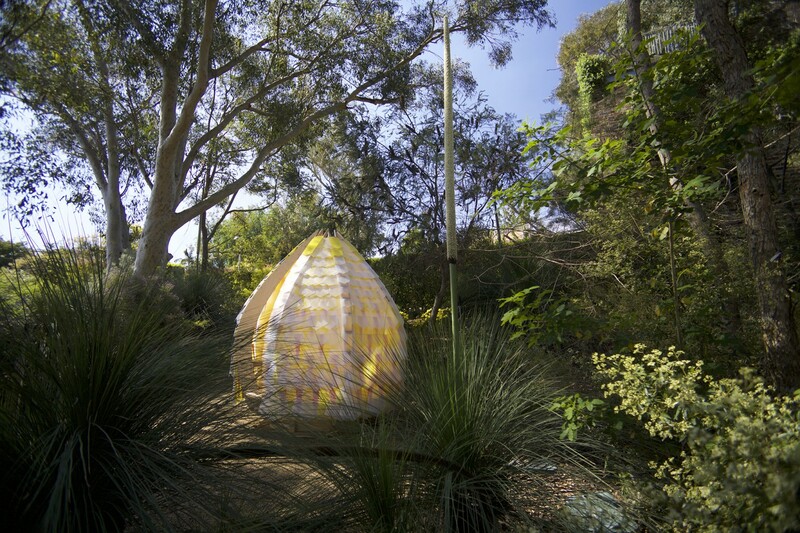 Eden Garden, Sydney; birch plywood, blackbutt, polypropylene, steel; approx. 2m diameter, 2.5m high. 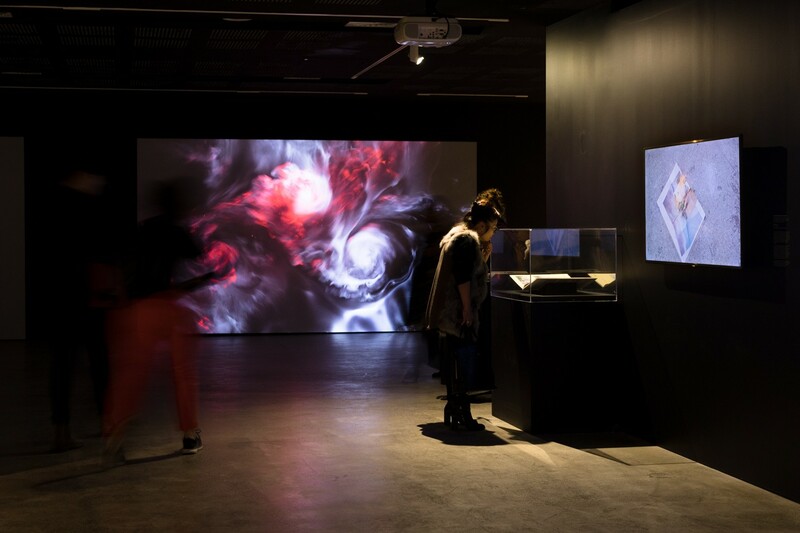 The Liquid Air (Breathing Structure) explores relationships between atmospheric pollution and ocean acidification through a collaboration between artist-architect Ainslie Murray and marine spatial ecologist Renata Ferrari. The work is developed from images of eroded branching corals and infant corals struggling to survive in the acidified ocean. A complex three-dimensional ‘breathing’ structure is threaded through an architectural space to explore parallels between underwater structures (branching corals) and atmospheric structures (built environments). We lost a tree. Its felling was devastating. We sat atop its freshly sawn trunk and grieved, and then we needed to make a restorative space. We studied artichokes. We studied onions. We studied tulips. And then we built this. Remains of a dead eucalypt, Fijian Cedar, Maple, steel, polypropylene, cable ties. And a mirror ball. 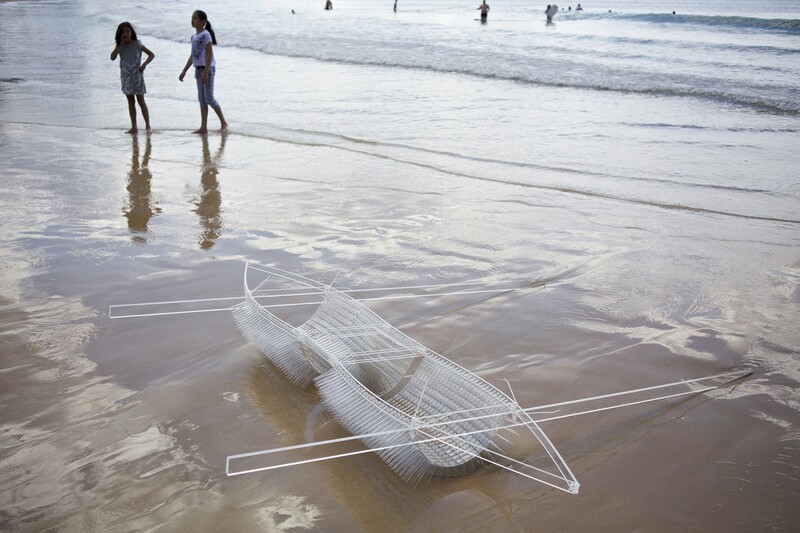 Two rafts were walked along the tideline from Queenscliff to Shelley as part of the Manly Arts Festival. They are made from bird spikes. The bird spikes are sold as a ‘humane’ form of species control. We install bird spikes on building ledges, signs and lights to prevent birds from landing. Though beguiling in gleam and form, they embody an unthinkable hostility toward the other. The assumption of the right of aggression toward another species insulates us from grasping the aggression of these objects. Look to the bird that flies past you just now and to the person who stands quietly beside you. 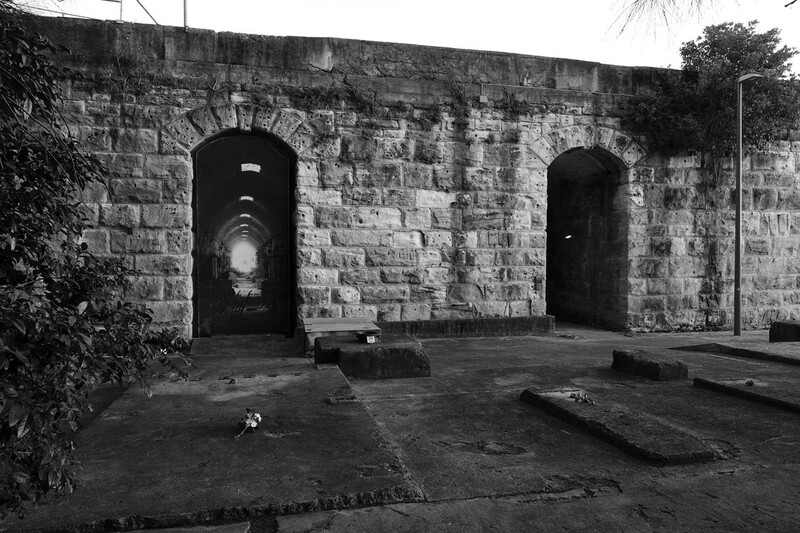 An image of a devastated souk in Aleppo, Syria, is grafted onto a Coal Loader tunnel. A dialogue emerges through the restorative act of hand-stitching, quietly suggesting a sense of the global and an empathy for the other in a distant place and context.